Ok… so that’s not the real translation but definitely a great description! 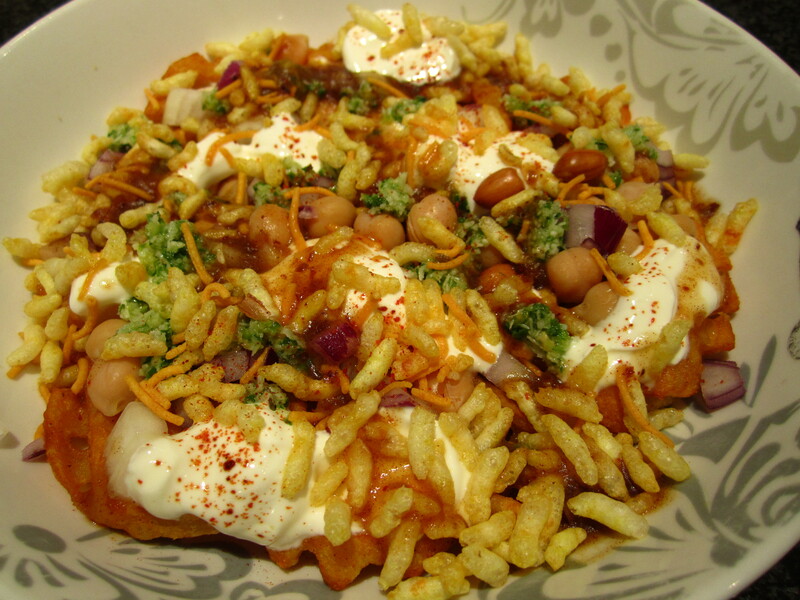 Bhel is one of my favourite party meals; crunchy, sweet, spicy and tangy all at the same time. We lay out the toppings on the table so that everyone can make up their bowl however they like – perfect for a party buffet. On the table lay out all of the toppings and let everyone helps themselves. My bowl usually goes something like this: A layer of potato lattices and chuna at the bottom, next a good sprinkling of red onion and some dollops of yoghurt, then a good drizzle of ambli ne kajoor ni chutney (when I say a good drizzle, I do tend to drench the potatoes as I really love this chutney), some splodges of lili chutney, then a handful of sev mumbra sprinkled on top (leave it til the end so it doesn’t go soggy in the chutney) and finally a little dash of lal chutney when I’m in the mood. There are really no rules here, so make it up however you fancy! 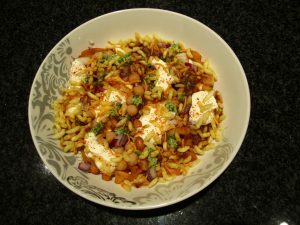 If you don’t have any sev mumbra or chevdo but are seriously craving bhel, then I’ve used crunched up salted potato crisps or potato sticks in the past with some extra lal chutney over the top and it’s not a bad substitute!